Atletico Madrid manager Diego Simeone has failed to rule his side out of a transfer swoop for Chelsea striker Alvaro Morata before the end of this month. 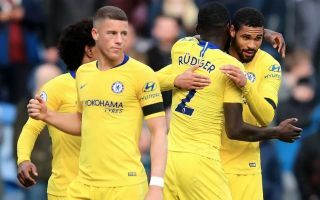 The Blues flop currently looks one of the most likely players to be on the move this January after something of a nightmare spell at Stamford Bridge since joining from Real Madrid last season. Morata has only 24 goals in 72 appearances for Chelsea in all competitions, and has become more well known for missing big chances than for putting them away. ESPN have recently linked the 26-year-old with Sevilla, saying his agent is in London for talks over a move, while Goal have also reported on Atletico joining the chase for his signature. When asked about a deal for Morata, Simeone would not rule anything out, suggesting he’s waiting on his club chiefs to sort out a number of potential ins and outs before the end of the month. “The only thing I’m thinking about is the upcoming match against Levante,” Simeone is quoted by Goal. “I don’t speak about players that aren’t with us, only those that are. “I can’t confirm or deny anything because coaches wait to see what the club can do. Chelsea fans will be desperate to see Morata leave so they can bring in an upgrade up front, with plenty of big names being linked with the west London giants this winter. Sky Sports have linked CFC with the likes of Gonzalo Higuain and Callum Wilson, while the Daily Mirror also reported of an interest in Inter Milan hot-shot Mauro Icardi.